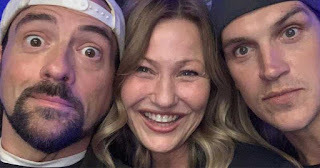 Kevin Smith is legit bringing the entire View Askew crew back together for Jay and Silent Bob Reboot. Not only are we getting the titular duo, with Smith joined by his hetero lifemate Jason Mewes, but others such as Jason Lee, Brian O'Halloran, Shannon Elizabeth, and more. Now you can add Rosario Dawson and Joey Lauren Adams, who played two of the most consequential women in Smith's films, are on board, too. Smith confirmed on Instagram that both Dawson and Adams are part of the Jay and Silent Bob Reboot cast. Adams will be reprising her role as Alyssa Jones in Chasing Amy, the 1997 film in which Ben Affleck plays a comic book artist who falls in love with a gay woman, and turns her through the power of his words and goatee. Yeah, it doesn't hold up so well. Dawson is back as Becky Scott, the love interest of O'Halloran's Dante Hicks in Clerks 2. I was hoping she'd return just so we could see where her relationship with Dante stood 13 years later, and now I guess we'll see. Those who follow Smith know what it must mean to him having Adams back. They were extremely close two decades ago and he wrote Chasing Amy for her and it's where the Bluntman and Chronic characters, which are integral to the Jay and Silent Bob plot, were born. Smith said, “When I saw her on shoot day, I said ‘See all these trucks? All this equipment and all these people came all the way to #neworleans today—all because you and I met 24 years ago"
Jay and Silent Bob Reboot has wrapped shooting but does not yet have a release date.